It rained all day. 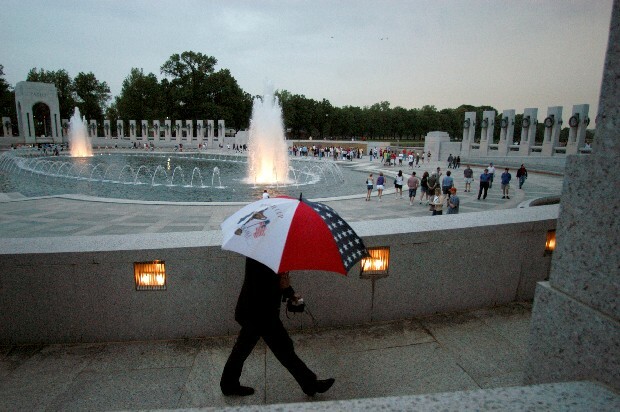 That didn't stop a lot of people from showing up at the World War II Monument that opened Friday. My friend Andrew read an article that said they were planning on having the "soft opening" earlier in the month. According to Andrew they postponed the soft opening because the monument wasn't yet handicap accessible. Being that the youngest WWII veterans are now about 74 years old, many of them use wheelchairs. The informant also mentioned that 1000 WWII vets die everyday. He said something about how once someone brought up the death statistics the project seemed to go faster.